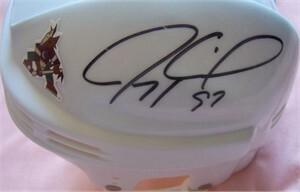 White Phoenix Coyotes mini helmet autographed in black marker by former star and future Hall of Famer Jeremy Roenick. NOTE: signature has minor flaws noticeable upon close inspection. With certificate of authenticity from AutographsForSale.com. ONLY ONE AVAILABLE FOR SALE.